The DEMEAU project (Demonstration of promising technologies to address emerging contaminants in water and wastewater) followed a solutions-oriented approach using applied research and demonstration sites, and explored four promising technologies for emerging contaminants removal and/or degradation: Managed Aquifer Recharge, Hybrid Ceramic Membrane Filtration, Automatic Neural Net Control Systems and Advanced Oxidation Techniques. Furthermore, Bioassays were investigated as an effect-based monitoring tool. The linked article shares new findings for each approach for tackling emerging pollutants and their potential for widespread integration in the drinking- and wastewater sector. 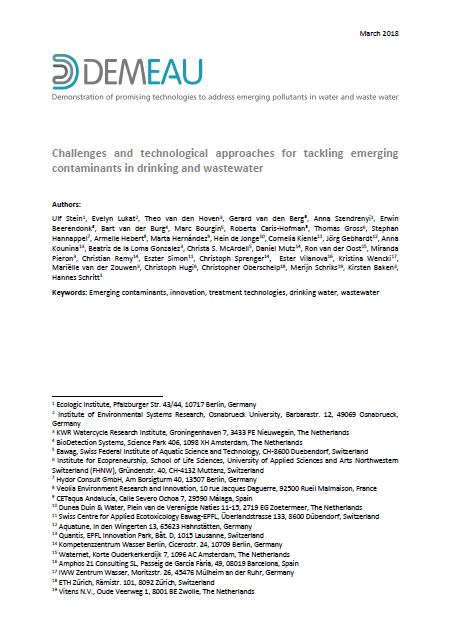 Research results from DEMEAU demonstration sites show that opportunities for synergies among these developments offer the most promising and effective methods for tackling emerging contaminants in the water sector. The article is available for download.